Highlighting some of the lesser known, but just as important past Armenian characters in India. Those Armenians who have some sort of connection, or maybe simply buried in Calcutta and other locations in India, I re-create their lives and put them into short stories, at least as much as I am able to. The Armenians of India are unique and their stories need to be told. I hope this blog goes a little way to telling those stories. Armenian graves in India www.chater-genealogy.com. Please help me to continue bringing them to you. A contribution, no matter how small will help. As I continue to review the Wills and Inventories of the various Armenian legacies and bequests left in India, a large and complex story is developing on some all-but-forgotten Catholic Armenians. 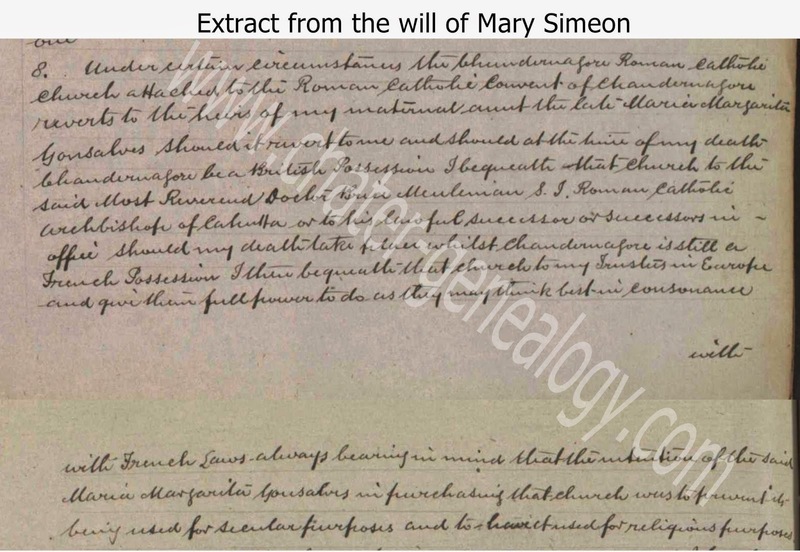 In this short blog post I will refer only to a small branch of a much larger family tree only because I am still working on the larger family tree and have yet to get to the British Library to research first hand. There is nothing quite like getting into original source material and although a nice selection of British Library documentation can be found on-line, there is MUCH more that isn’t available to the internet user and a trip to London is always nice. ".........Item 8. 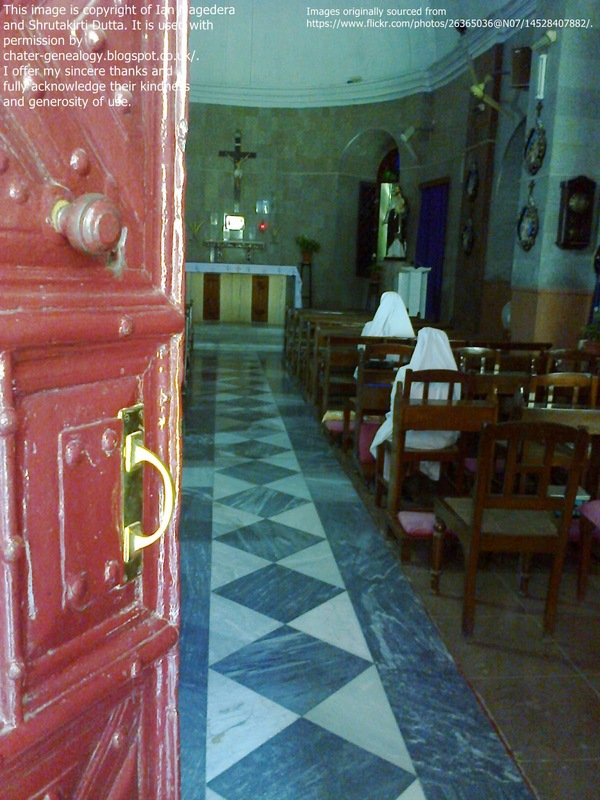 Under certain circumstances the Chundernagore Roman Catholic Church attached to the Roman Catholic Convent of Chandernagore reverts to the heirs of my maternal aunt the late Maria Margarita Gonsalves should it revert to me and should at the time of my death Changernagore be a British Possession, I bequeath that church to the said most Reverend Doctor Brice Menlemain s.j. Roman Catholic Archbishop of Calcutta or to his lawful successor or successors in office should my death take place whilst Chandernagore is still a French Possession I then bequeath that church to my trustees in Europe and give them full power to do as they may think best in consonance with French laws always bearing in mind that the intention of the said Maria Margareita Gonsalves in purchasing that church was to prevent it being used for secular purposes and to have it used for religious purposes............."
The same paragraph is repeated in the Will of John Simeon, Mary’s brother. The siblings died within 3 months of each other, John in March 1918 and Mary in June of that year. 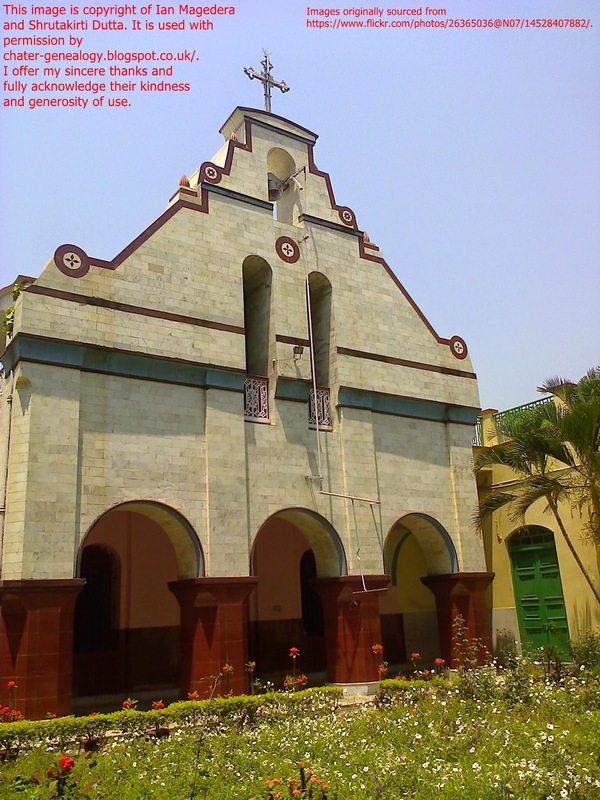 They both wanted to ensure the future and continuation of the church at Chandernagore. The Chapel was established in 1720 by the Roman Catholic Clergymen of Tibet mission. In 1869, the Chapel was presented to the Sisters of St Joseph’s Convent by Mrs Gonsalves. 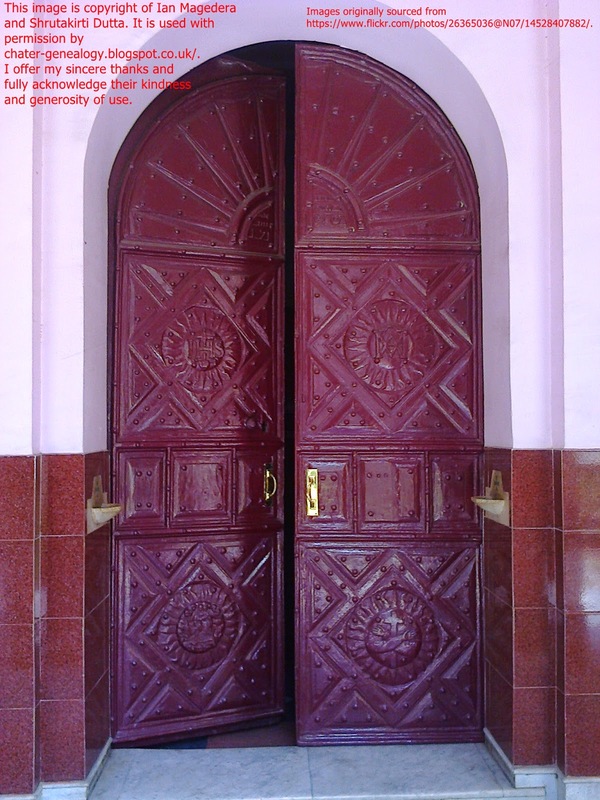 The massive entrance door has the date 1720 inscribed on its metal framework." Acknowledgements and my grateful thanks for the use of their images go to Shrutakirti Dutta, Ian Magedera and their flickr site https://www.flickr.com/photos/26365036@N07/14528407882/. The fact that the heritage site mentions Mrs. Gonsalves by name is a good indication I have found the right church. In addition, St. Joseph's Convent website http://sjc.net.in/community.php also gives a hint to the purchase of the chapel, although they do not seem to know the name of the donor. They state: "In 1869, an old chapel, which had been built by the Capuchin Fathers, and which touched our establishment, was bought by a generous lady who gifted it to the community....."
Mrs. Gonsalves is a 1st cousin once removed of Rose Nesbitt of Bombay who in 1787 built a private chapel in Mazgaon which is the present day St. Anne’s Church. A wealthy woman at her death her inventory consisted of several properties comprising 11 houses, 3 stables, 13 warehouses and 1 office within the Fort; an extensive house and grounds at Byculla; the estate and village of Mattawady, another house at Byculla and a piece of land with a stable at Mahim. Rose’s husband was the Bombay H.C. Marine Commodore Andrew Nesbitt. Upon her death the chapel and her property were transferred to the Roman Catholic Church. She was buried within her own private chapel but it would appear that in the 1960’s after the Second Vatican Council, which decreed that the celebrant face the congregation her remains were removed from the grave in her Church, and are said to have been interred at the foot of one of the two side altars of the present Church. Sadly during this process her tombstone was not preserved. The foundation stone is the only remaining original piece of her chapel, and can be found in the sacristy of the current St. Anne’s Church, it says “This church was built by Rose Nesbitt in honour of St. Anne 1787”. It would appear charitable and philanthropic traits run in the family and I have no doubt that Rose Nesbitt’s generous example of giving back to the Catholic Church played a large part in her cousin Mary Gonsalves’s own devotion to the Church. A second cousin of Mary Gonsalves, another Catholic Armenian from Madras also built a Roman Catholic Church, but this one was in Surrey, just outside London. 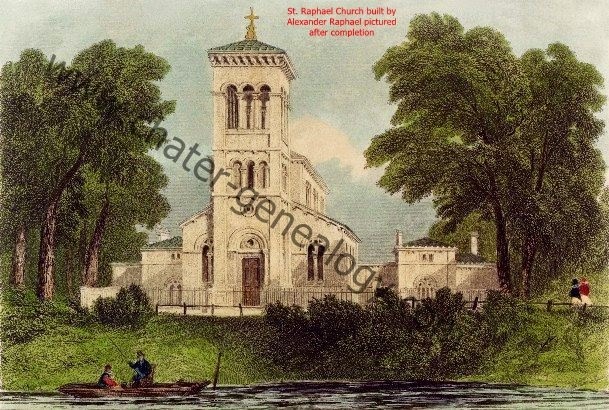 Alexander Raphael (1775-1850) built the St. Raphael's Roman Catholic Church in Kingston Surrey as his own personal chapel and it was part of his vast estate in Surrey in the grounds of his home Ditton Lodge at Thames Ditton. The Coat of Arms of Alexander Raphael Esq., a Catholic Armenian from Madras. M.P. for St. Albans Hertfordshire, and the first Roman Catholic Sheriff of London. Note that Mount Ararat is included in the crest. 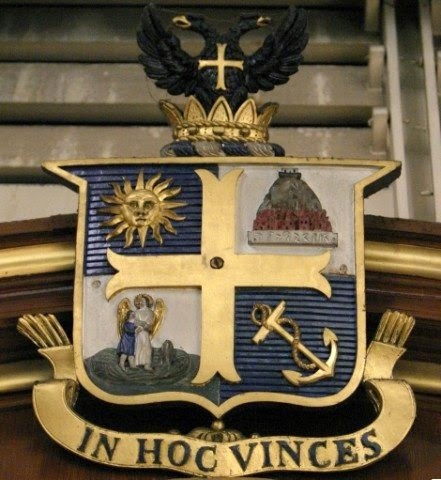 This coat of arms is still in use by the family today by the Savile Family. He is also credited with being the creator and builder of the town of Surbiton. He donated hundreds of thousands of Pounds to the Catholic Church. The family crest (above) is built into the stained glass windows of the church. He is buried in the crypt of St. Raphael's church. The family both near and extended were devoted to the Catholic faith and it is extraordinary to find such evidence of church building by Armenian cousins within a family. I am in the process of a more detailed blog article on Rose Nesbitt, her family and her Armenian connections which I hope to post here soon. This blog is copyright of Liz Chater 2017. Simple theme. Theme images by luoman. Powered by Blogger.